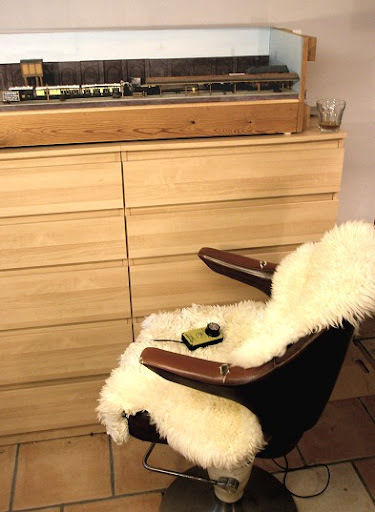 Before you think that this is a dental blog, I am referring here to a new chair that gracefully supports my backside during layout operating sessions. Strangely, neither my wife nor teenage kids have been able to mobilize any enthusiasm for this great find - I guess they have finally given up hope in me. 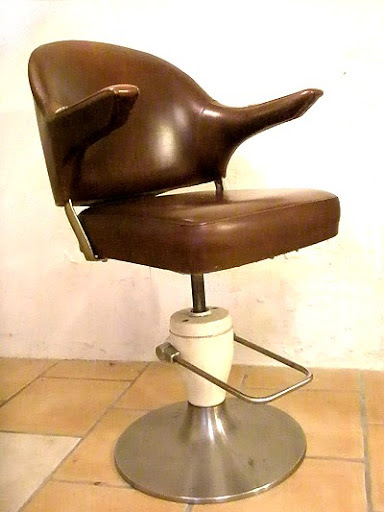 It is in fact an old hydraulic barber's chair that the founders of my workplace picked out of a scrapheap when they first started the business (well we all have to start somewhere!). It was duly employed for many years as an office chair and became a sort of symbol of the company's humble beginnings, until it was finally considered too outdated to match the fancy new postmodern office furniture. How unjust the world can be! So I saved it from a return to the scrapheap and it has now quickly become a good and much valued friend. You will kindly note the lambskin and the glass of whiskey. Life can be tough, but it does have its moments!